Setting up tents may be interesting the first time, but afterwards the faster you can get it up, the better. Especially if you’ve been hiking for a while and are very tired, the last thing you want to do is start setting up the poles and fitting things. Well the people who manufacture tents understand that which is why there is a wide range of instant tents on the market today. Today I’ll be reviewing the best instant tents out now so you can see which one will suit you the best. Let’s get into it. What to Look For in a Tent? 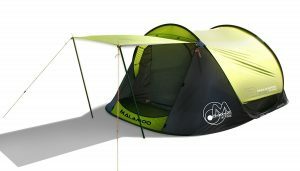 OzTent Malamoo X-Tra – Best Quick Setup Tent? 3 season – The most common style. Their main purpose is to be lightweight shelters for mild conditions including fall, summer and spring. In most cases they’re equipped with mesh panels that help to boost air flow. Do note that the mesh panels will protect against bugs but not against powdery sand. 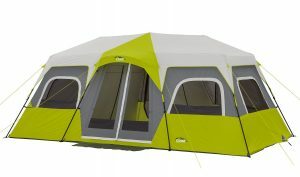 If paired with a well-positioned rainfly, these tents are able to stand up to heavy rains in addition to strong winds. And while their thickness and insulation isn’t as good as 4 season tents, it should still shield you against light snow. 4 season – These tents are designed to withstand really strong winds and heavy snow. However, since these tents are made from heavier fabrics and have more poles than their 3 season counterparts, you won’t find any instant tents that are 4 season simply due to the nature of 4 season tents. So if you are looking to camp in moderate snow and want an instant tent then you’re out of luck as of now until someone makes a tent like that. I’m going to let you in to a little secret – manufacturers usually measure their capacity using the smallest space estimation per adult that they can so it would look like their tent can support more than their competitors. So yes, a 4 person tent can technically support 4 people, but only if they’re all kids or midgets and have the smallest sleeping bag on. If you or one of your group members is over 6 feet, then consider getting a tent with a minimum length of at least 90 inches to ensure comfort for everyone. While 1 door is enough for many occasions, you may want to consider so of the benefits of 2 door tents. For one, if someone wants to go to the bathroom, they won’t have to climb over everyone to exit the tent. Additionally, having 2 door tents will help with the ventilation. When looking at doors, also keep in mind that YKK zippers are more durable and resist snagging. Finally, the loudness of the zipper is important to consider if you don’t want to wake up anyone sleeping while you try to exit or enter the tent. Apart from measuring durability in the ability to withstand wear and tear, with camping you also have to take into account the damage from UV rays. For many people who don’t go camping much, they might gloss over this as they either don’t know or don’t really see how the sun can damage tent material. However, unless you only camp once or twice a year and in shade, then you should buy material resistant to UV damage. The best material against UV damage is canvas with polyester coming in second. Avoid plain nylon as it is one of the least resistant materials. But, as mentioned before, if you camp rarely and in shade, then anything will do. Do note that even lifetime tent warranties don’t cover UV damage. One of the most important things in rain protection is having a rainfly. A rainfly is basically a separate waterproof cover which is made to fit over your tent. They typically come in 2 styles: roof-only which offers more light and fair rain protection and full-coverage which offers maximum protection from both rain and wind. Regarding seams, factory taped seams are of high importance when it comes to rain protection. Regardless, it is always good and recommended by tent experts to put some seam sealer on the tent periodically. This is especially true for the cheaper tents. Weight is mostly an issue for those who carry their tents while backpacking or hiking. If you bring it with you in a car, you shouldn’t worry much about this. In the car the bigger issue is the space that it takes so that you can fit all your things on your outing. Coleman is a known name when it comes to tents, including instant tents, and not without its reasons. 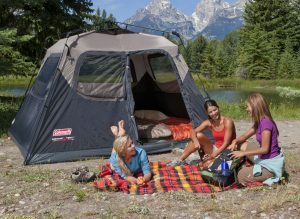 The 6-Person is one of their best instant tent offering for those who are out with their families. Measuring 10’ x 9’ x 6’, this tent can fit up to 6 people however try to keep it around 4, maybe 5 to maintain comfort and free space for everyone. Talking about comfort this tent is pretty tall with a 6’ height, which is great for those who are taller. You also get a decent amount of floor area of around 1100 square inches. It folds up into a 10” x 10” x 4’ size but given its weight of 24.9 lb. 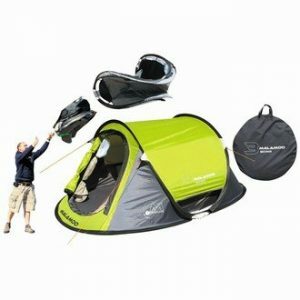 this tent is best carried by a car or other similar transportation as hiking with this is not going to be comfortable. Regarding its ability to withstand severe weather, it should hold up to winds and rain exceeding 50 mph provided you have it with a rainfly and some better stakes. Now the base model doesn’t come with a rainfly, but there is a tent + rainfly kit available for purchase. Regardless if you purchase a rainfly or not, I always recommend getting some tent seam sealer just in case as it’s better to be safe than sorry. A good feature of this instant tent is the excellent airflow. This is thanks to the 2 side windows, a front window by the door and inside the door and a large back window in addition to 2 roof vents. Not many other tents have roof vents so kudos to Coleman for including them here. Talking about windows, the window flap will hang inside when unzipped but you can do this clever little trick of zipping it up about 4 inches or so, and folding the flap inside the pocket. A little tip when taking it down: partially leave a window or 2 open to let the air escape. Now onto the cons. Firstly, as mentioned before it doesn’t come with a rainfly included, and unless you get one, you have a chance of getting yourself and your stuff wet in a heavy rain scenario. However do note that the bundle on amazon for the tent + rainfly comes with a 4 person rainfly for some reason so get the 6 person one that will fit over this tent instead. Secondly, you only get 2 storage pockets with the tent. Seeing as it’s designed for 6 people, I don’t see why they didn’t add a couple more pockets. Lastly, the zippers create a kind of a corner on the bottom of the door. This corner is not fully closed and does have a small gap which might let some rain and tiny insects through. In the end, the Coleman 6-Person is a great tent that, aside from a few small issues, should serve you well. If you want a tent that can hold many people, is pretty tall or has a lot of elbow room if camping with few people then this 8 person tent by Coleman is a pretty good one to consider. This tent is pretty roomy, having enough space to fit 2 queen airbeds thanks to its floor area of 140 ft2 which is a big plus. You also get a maximum height of 6 feet and 5 inches which should be enough for almost everyone but NBA players. The material is 150D heavy duty fabric which should do well to hold up against rain. There is also a convenient divider on this tent if you want to use it. True to its name, this tent can be quickly set up with some practice, and people have managed to get it going in less than a minute. The take down is also easy, as expected. 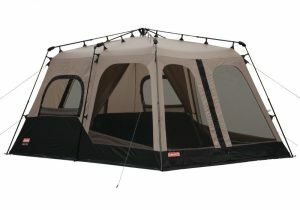 Finally, this tent comes with plenty of windows which are good for airflow. However, there are no roof vents like the 6 person model which limits the amount of heat escaped due to heat rising up. And this brings us to the cons. Similarly to the 6-Person Coleman, there is no included rain fly as well. This means that if you want to camp in a place where heavy rain is highly probable, you might be disappointed. It’s also pretty bulky weighing in at around 37 lb. meaning that you’ll have a bad time trying to backpack with it. When entering and exiting you need to use both hands – 1 to hold bottom of zipper and 1 to raise the zipper tab. This means that if you are trying to bring things in and out of the tent while trying to always keep it closed, it might get annoying. The windows don’t have ties and some don’t fully zip the top. The little space on top is prone to dust flying in if you’re camping in a desert-like environment. The tent bag is slightly too small to put the tent back and I recommend getting better pegs if you are facing windy conditions. Finally, the hinges are ok quality so you really want to stake it down to prevent them from bending. This is one of my personal favorite tents, and one that I have covered much more in depth here if you’re interested. The most unique thing about this tent is the fact that you can pop it open in only 3 seconds. Talk about instant. Of course this doesn’t include setting up the pegs. The tent is made from a 2 layer polyester lining. The outer layer is a weatherproof fly and the inner lining is breathable. The waterproof rating (hydrostatic head) on the outer layer is 2000 mm for the fly and 3000 mm for the floor, which makes it good even in rainy conditions. If you have both rain and heavy winds, this tent will hold well as it is a 3 season tent. Regarding the material of the tent, while it is lightweight, it’s pretty thin which allows a substantial amount of sunlight in. 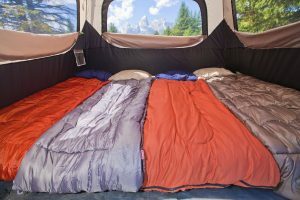 This can be detrimental if you’re trying to sleep in in the morning but it also makes the tent not as dark during the day. The frame is made from fiber glass and there is a door that can turn into an awning. The awning is one of its cons as well since it is not zippered meaning in winds it can flutter around. You also get a vestibule which you can use to store your muddy shoes and gear in to keep the interior clean and dry. Inside you get 2 interior pockets and ample room for 2 people or 3 if you don’t mind being close to each other. Talking about space, the maximum height of the tent is 125 cm which isn’t enough to stand in but you should be able to sit up without many issues. If you like the easiness of setting up this tent but also think that it’s too small then consider the Malamoo Mega instead. You get the same exact tent but bigger. While the X-Tra measures in at 9’10” x 6’6” x 4’1” the Mega comes in at 11’11” x 8’2” x 4’11”. The Mega also sleeps 4 but I would keep it at maximum 3 to be comfortable. Finally, the X-Tra weighs in at 13 lb. which is pretty light and when folded up it is a disk that has a diameter of around 3’3”. The Mega variant is only 3” wider. 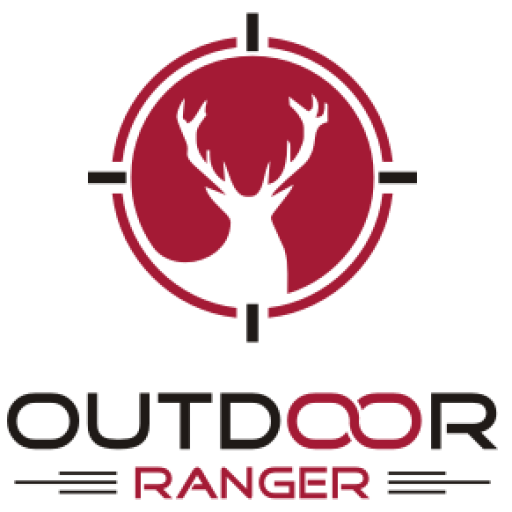 If you are looking for the best quick setup tent then the Malamoo X-Tra and Mega are both solid options that anyone can easily set up. It is a little tricky to fold it back down, but once you do it once, you’ll get the hang of it pretty quickly. Usually you wouldn’t hear “instant” and “12 person tent” in the same sentence as the bigger tents usually take longer to set up. However, the CORE 12 person tent is actually one of the only large tents that you can set up by yourself in a few minutes or with someone else under 2 minutes. 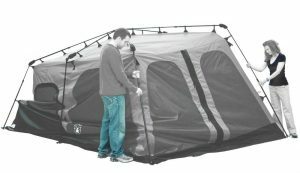 With the CORE tent you get an included rain fly and 2 room dividers. 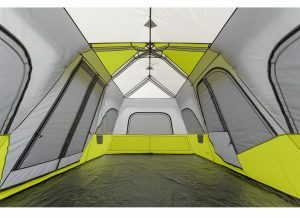 The huge interior of the tent allows you to comfortably fit in 3 queen mattresses. 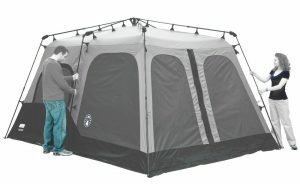 No matter how tall you are, you will be able to fit in this tent as its center height is a whopping 80”. Regarding weather handling, this tent manages to keep you and your belongings dry in light to heavy rain. You do get some slight leaking at the door and the seams along the sides in heavy rain but it’s nothing too bad. In windy conditions it also holds up pretty well and while it may shake around and look like it might fall it manages to stand. The tent is also pretty well ventilated so you won’t get hot while using it in warmer climates. Now it does say it’s a 12 person tent but unless you’re in a dwarf party camping trip you’re better off with a maximum of 8-9 people. 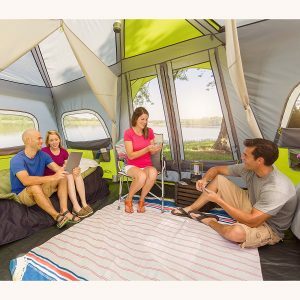 If you are out and camping with your family this tent is also good since now you can set up everyone to have their own mattress and still have room to spare. Some other features include a lantern hook and side pockets for storage. However, the elephant in the room for this tent is durability. As expected, some sacrifices have to be made to have a tent of this magnitude that also sets up quickly. The material might have small holes after prolonged multiple uses. Additionally the design of the rainfly clip-ons could use some improvement as the clips can come off during wind due to a buildup of pressure. This gives slack to guylines and can potentially bend the poles. 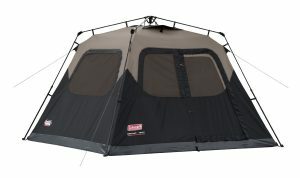 In the end, this is a good tent if you are out with a large group or want a lot of space to move around in. But do note that for prolonged multiple usage, I would recommend going with the more durable OzTent or Coleman instead. That about wraps up our best instant tent reviews. I hope you found some great information here that will help you to make an educated purchase. Until next time.